All right, so that was a fun little thing to do last week. Here’s to keeping 5 on Fridays going! 1. 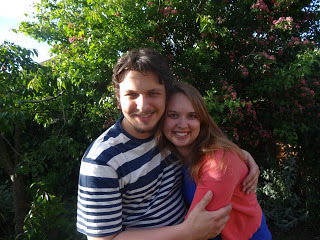 Cambridge: Last weekend, as I mentioned, I was reunited with my dear friend Josh and his family! It was lovely to get away from the hustle and bustle of the city for a couple of days, and to catch up with Josh. When we only get to see each other once every few years, we take every chance to see each other we can get. I’m so glad our friendship has kept going for the seven years since we moved from Atlanta! 2. Hampton Court & Wimbledon: We had Monday off from scheduled activities, too, so I used the day to explore a little farther outside the city. 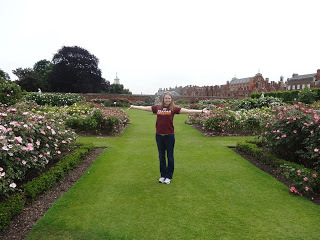 One of my professors recommended I visit Hampton Court Palace, and specifically its rose garden, so that was my planned outing for the day. I must have walked around the rose garden five times. There were roses upon roses upon roses, and they smelled divine. 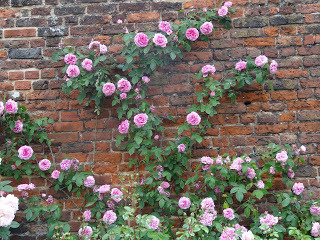 The British sure know how to do roses the right way! On my train ride out to Hampton Court, I noticed one of the stops was Wimbledon. I’m a huge tennis fan and had wanted to see the All England Lawn Tennis Club, but no one else on the trip is as big a fan as me, so I had no company. 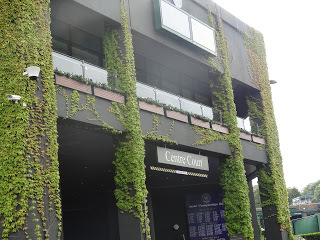 Since I was already out, I decided to stop at Wimbledon on my way back from Hampton Court and find the tennis center. Little did I know that the tennis center is actually about a 25-minute walk from the underground station…but it was an easy walk and there were plenty of signs and maps to keep me on course. I didn’t get to walk around the grounds because they were cleaning and prepping for the tournament to start, but I walked through the museum and got to see Centre Court from afar. And that was plenty for me, for now. One day in my life, I’ll go back and actually get to walk around. But for now, I can be happy. 4. Finally had a burger: I love burgers. I love beef in any form, really, but especially burgers. I had not had a burger since before I left America, so at this point in the trip, my craving for beef had kicked in. Eating on a budget here is really difficult, but if you look hard enough, you can find a good deal somewhere. There’s a chain called Gourmet Burger Kitchen, and I’d been contemplating giving it a try, but it seemed too much like “fast food,” and I wanted something different. After being out in Leicester Square for a little while, I passed by The Porcupine, where I’ve been for breakfast a few times, and decided to give their “real food” a try. A quick skim of the menu led me to a “classic burger,” with chips included, for about 9.50 pounds. Not exactly cheap, but a better price than many other places I’d seen around the city. Eating healthy here has also been difficult; I’ve missed my salads a lot, too, so I was also happy to see that I could “go skinny” and switch my chips for a salad. My burger was juicy and delicious, and the salad was a great complement. I’m glad I didn’t have to wait the entire month to satisfy my soft spot for burgers. 5. The Daniel Radcliffe Experience: It’s pretty much exactly what it sounds like. 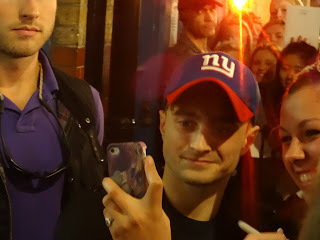 Wednesday night, we saw a play called The Cripple of Inishman, in which Radcliffe plays the lead role. After the show, someone in my group said we could go around to the stage door and see if he would come out to sign autographs and such. After a 40-minute wait (which felt much longer), he came out and people went nuts. Some people in my group pushed forward and managed to get autographs on their tickets or show programs, but four of us–myself included–missed it. I got a few decent pictures, so I figured that’d be enough to satisfy me. It didn’t take but about 10 minutes before I decided no, it wasn’t enough. Another girl who barely missed him said she was going to Google more show times when we got back to the flat, and maybe the four of us could go back and try again. So we did. Kelli, Jill, Mai and I got back to the theatre around 9:30, knowing the play would end around 10, which gave us plenty of time to get in line and hope for a good spot. After another long wait, Daniel came out around 10:45. This time, we were successful! Kelli even got a picture with him! What impressed me more about the entire experience was just how cool and “real” he was. 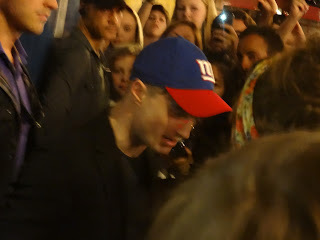 He didn’t act like a celebrity at all; he actually said hello to each person he signed for, and responded to comments from people in the crowd. I got the impression that he really cares about his fans. The whole night was just a really cool experience, and definitely worth testing my claustrophobia…twice. The tube ride back to the flats wasn’t exactly the highlight of my week. 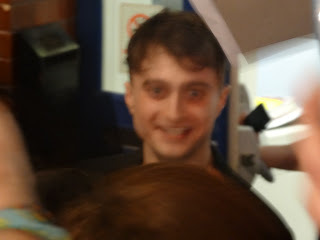 But getting Daniel Radcliffe’s autograph? Worth it. Note the hat…apparently he’s a big American football fan! He was cool and took pics with a few fans. I didn’t get that close, but Kelli did! P.S. a couple of us did slip in a “Go Giants!” when he walked by and signed for us.